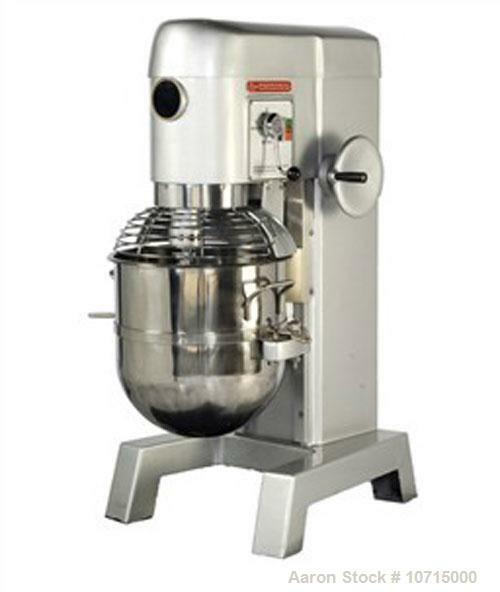 Unused-NEW: 40 Quart all purpose dough mixer with bowl accessories. Heavy duty motor to meet demanding operations. Agitators are designed for long term use and heavy conditions. The bowl locks at the top of its travel and is raised/lowered manually with a rotating hand lever. Toggle switch with mechanical shift handle controls. Three speed transmission; low speed is 96 rpm, intermediate speed is 168 rpm and high speed is 306 rpm. Dimensions: 23.5" long x 22.8" wide x 48.4" high. Available in 3 phase, 60 hz, 220V, 230V, 460 and 480V. Crating charge $165.00. Machine approximate weight 540 lbs.